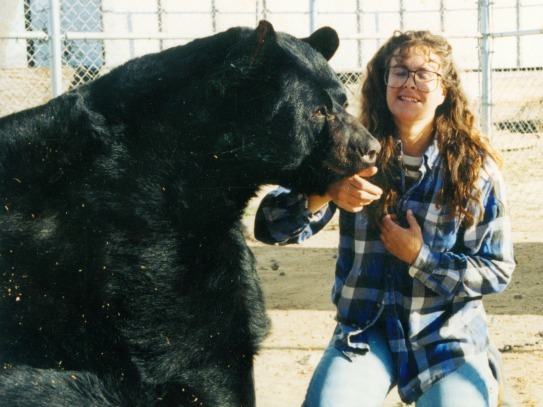 I am a 25 year veteran of the wild animal world, experienced in applied animal behavior-handling, training and exposure to all types of exotic species from various countries throughout the world. I concentrated mostly on the North American animals. I have had years of experience on movie sets with wildlife and animal training for media projects (film, TV commercials, ads, still shoots, live events, displays etc). 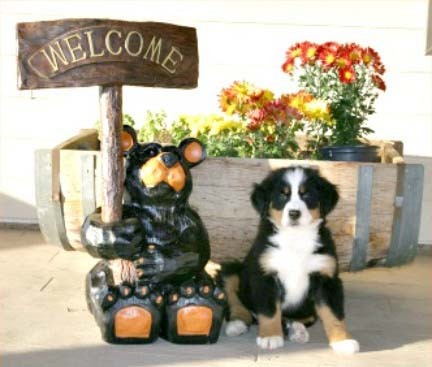 I acquired my first Bernese Mountain Dog because of the love I have for the American Black Bear. One afternoon, seeing a Bernese on the sunny beach of Malibu in Southern California with its gentle, loving eyes and big bear look caught my eye, reminding me of my days working with Black Bears, from then on I was hooked. The Bernese Mountain Dog is a large size dog with its tri-color coat, eye catching appearance, regal stance and wonderfully natured personality. Raised for hundreds of years in the valleys and mountains of the Swiss Alps. Berners were used for a particular purpose by farmers to protect the homestead and pull dairy wagons filled with cheese and milk jugs. Today they are simply family pets, watching the home, pulling wagons filled with firewood and carrying backpacks for hikers. The Bernese Mountain Dog has several distinctive characteristics. 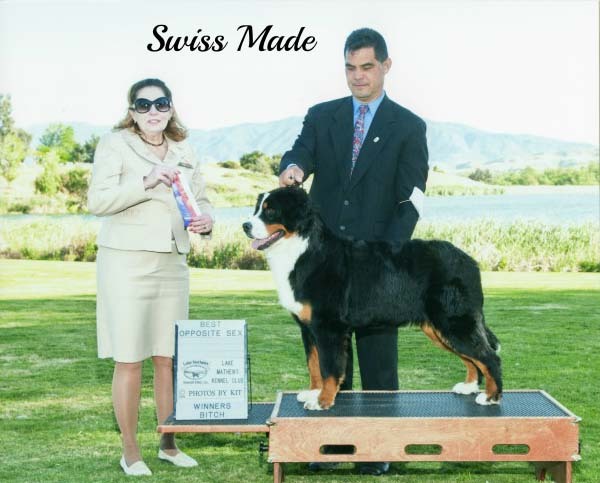 The Berner coat is thick, shiny and fairly long and can be straight or wavy, not curly. The base color is black with white blaze down the face and chest with white tips on the feet and tail. Rust markings appear over the eyes, on the cheeks and on all four legs. 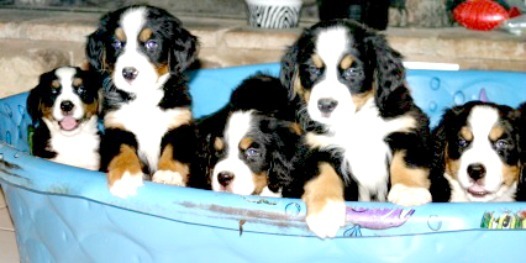 Berners are physically sturdy and appear square, weighing 75 to 120 pounds. The life span of the Bernese Mountain Dog is equal to other large breed dogs with most living between six and eight years. Although a ten or twelve year old Berner is not uncommon. The Bernese Mountain Dog’s intelligence, eager desire to please and pleasant temperament make it a popular breed choice. They are often certified as therapy dogs. With their natural liking of children, Berners are found working as reading dogs and classroom companions. They have an easy going nature and socialize well with human and other companion animals. These characteristics also make the Berner a trust worthy family dog. A small breeding program with a few exceptional dogs. I take great pride in my canine companions. All my dogs are raised in a home environment. I strive to produce in my breeding program healthy, long living, premium quality puppies suitable to be a loving family pet, or capable of continuing there heritage. Temperament is of most importance. My dogs are alert, self-confident and good natured from beginning to end. My dogs have wonderful toplines, sturdy bone, beautiful dark eyes, the exceptional Berner head with a short muzzle and wide crown, a total package. My dogs reflect the Classic Berner type. I am devoted to the betterment of wonderful family companions and the next show marvel. Located on a five acre ranch in the beautiful, serene High Desert of Southern California.